Atlanta is well known for city life, and most days the energy of the city keeps its residents and visitors fueled up for work and fun. However, there are days when connecting with nature is a necessity and going for a run, a hike, or a bike ride is needed to recharge for the next day. With the hustle and bustle and the city's infamous traffic, escaping isn't always easy. These 10 adventures within an hour of Atlanta make your escape that much easier. Choose one or explore all 10, just make sure to get outside and play. 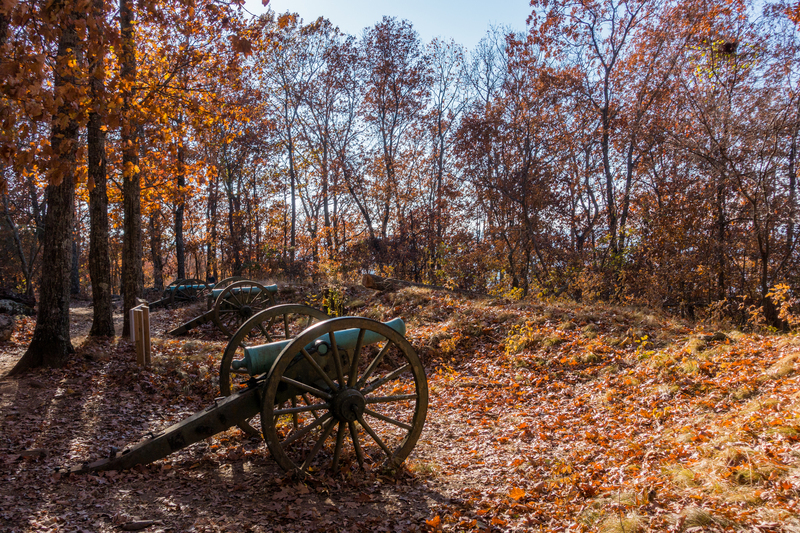 A cannon emplacement on Kennesaw Mountain. Kevin Murray. Exploring Kennesaw comes with a great pay off! The summit is the highest point in the Metro Atlanta area, so once you reach the top you'll have a stunning view of the city skyline! 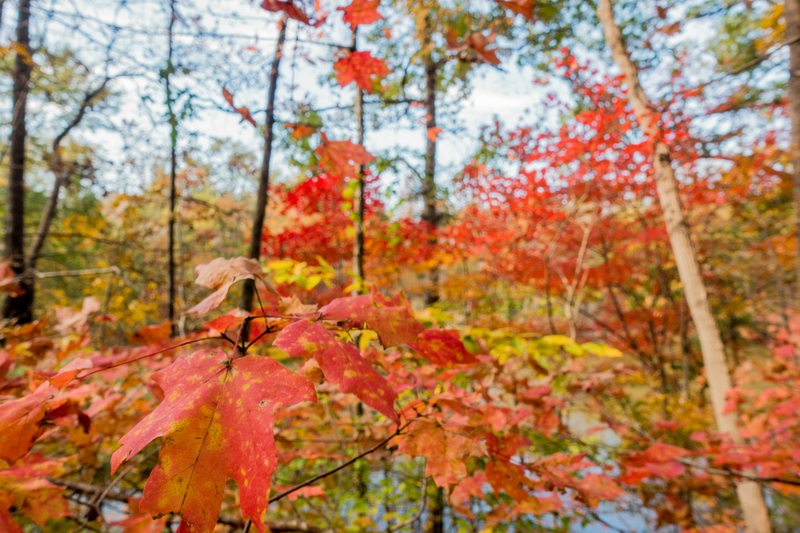 From the Cherokee to the Civil War and the ruins of a mill built in 1849, the Sweetwater Creek State Park is filled with history and offers up a good dose of the outdoors. Crimson hues of the Gold Branch Trail in autumn. Kevin Murray. Wildlife viewing doesn't happen often in downtown Atlanta, but it does on the Gold Branch Trail! Take a hike and hang out with the critters of the city. Paddle, run, or take the dog out for some fun. Morgan Falls River park offers up multiple activities and is perfect for a Sunday afternoon. If you're looking for a place to hang your hammock, explore a bamboo forest, take a hike, or paddle a Class I or Class II run in your kayak, you're going to want to check out East Palisades along the Chattahoochee River. 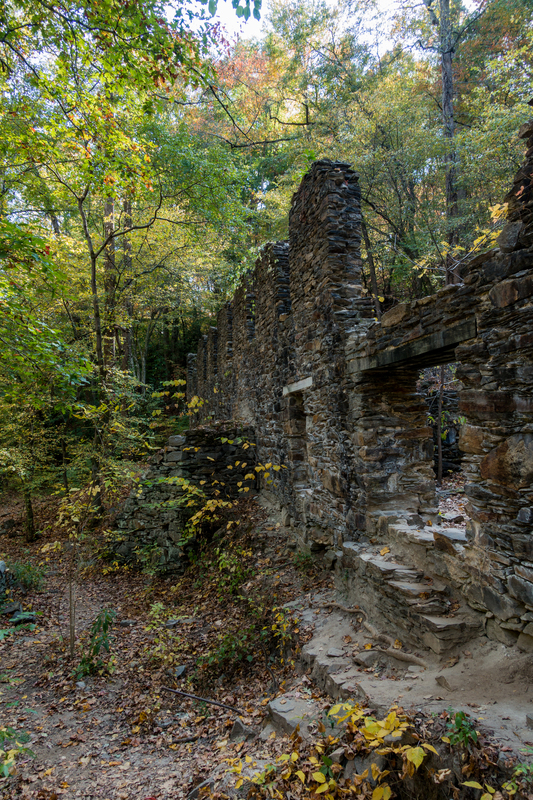 The mill ruins at Sope Creek. Kevin Murray. Trail running, mountain biking, historical ruins, wildflowers, and more make up this adventure spot. There's a little of something for everyone, making it a perfect location for a weekend escape from the city. Lake life at it's best. Put this spot on your summer bucket list. The park is a popular destination for swimming, boating, picnics, and hiking. The Old Atlanta Park Nature Trail is perfect for an afternoon with the family or your pup. The trail is perfect for all fitness levels and an excellent spot to relax! Boasting 3,200 acres of beauty, Stone Mountain is an Atlanta-area destination for camping, stand-up paddle boarding, hiking, biking, and countless other opportunities to move and explore. Over a 100 acres of trails, a lake, picnic areas and more, Murphey Candler Park is a outdoor oasis close to the core of Atlanta. In addition to its playing fields, tennis courts, and swimming pool, the waters of Murphey Candler Lake are stocked with largemouth bass and bluegill, among others, to fish.